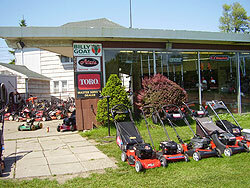 Are you looking for affordable lawn mower parts in West Seneca, NY? 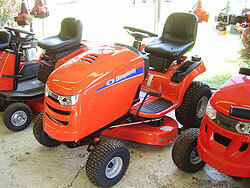 Do you need lawn mower repair service to keep your machine running properly? Do you need small engine repair on a piece of your equipment in the Buffalo, NY area? With the price of this equipment constantly on the rise, you need affordable solutions for your equipment needs. From replacement parts and equipment rental to repair service and equipment sales, there is one company that can provide you with the affordable, reliable equipment solutions you need to get the job done right. Schaub Equipment Rental has been serving customers throughout the Western New York community for more than 50 years, providing part sales, small engine repair, and rental for a full range of items, including lawn and snow equipment. We rent a variety of equipment to both contractors and homeowners throughout Western New York at affordable rates. If you have a one-time project, you certainly don’t want to invest in a piece of equipment you will only use once. It also may not make financial sense to hire a contractor or sub-contractor to do the work for you. In this case, equipment rental is a great option to get your project done without spending a lot of money. At Schaub Equipment rental, we stand behind every piece of equipment we rent or sell to ensure that you can get the job done quickly and effectively. Our helpful technicians can also assist you and make sure you know how to properly handle the equipment before you get to work. We provide professional lawn mower repair! 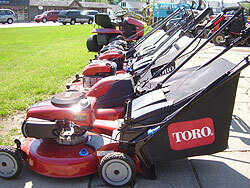 If you own your own equipment and it isn’t functioning properly, we provide lawn mower repair. Our highly skilled technicians can fix anything we sell or rent, and we will have your equipment running properly in no time. If you are a do-it-yourselfer and just need the replacement parts, we can help there too. We stock a large inventory of parts for all sorts of equipment, and we can even make a special order if we don’t have what you need in stock. With all the parts and services you will ever need, your equipment will give you a lifetime of performance. We are located at 2902 Seneca Street in West Seneca, NY near Route 400. We are open from 8 a.m. to 6.p.m. on Mondays, Tuesdays, Thursdays, and Fridays, 8 a.m. to Noon on Wednesdays, and 8 a.m. to 5 p.m. on Saturdays. We accept Visa, MasterCard, and Discover, and of course, cash is always accepted. Schaub Equipment is a Proud Member of the West Seneca Chamber of Commerce. Let Schaub Equipment Rental give you the right tools you need to get the job done, whether it’s the start of summer or the middle of winter. With more than 50 years of experience, Schaub Equipment Rental has the knowledge and expertise to help you with any project of any size. Become a fan of Schaub Equipment Rental on Facebook to receive the latest updates and special offers. Proudly serving the Buffalo, NY and the Western New York area.